Only A (1.0.7) is no longer in the App Store! (Apple deprecated it's audio API). But you can still listen to the Only A Repository! You are swimming in 'A's, and this app helps you find them and record them! This specialized app listens for six octaves of the note 'A' in your audio environment, and can record all the 'A' notes it hears. 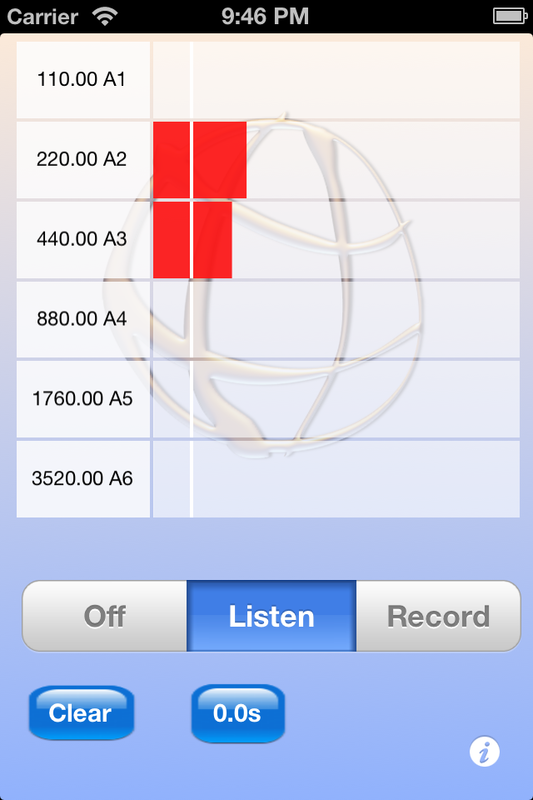 Then you can upload that recording to a special website which collects worldwide recordings of 'A's. On that website, you can play several contributed A recordings simultaneously. 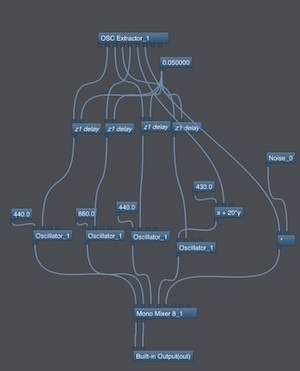 Only A can also send out an OSC stream that can be picked up by apps and desktop programs that can understand OSC. Written for the Tuning Worlds festival, a project of Aune Head Arts, Dartington, England. Touch "Listen" to turn on the listening bar graph. 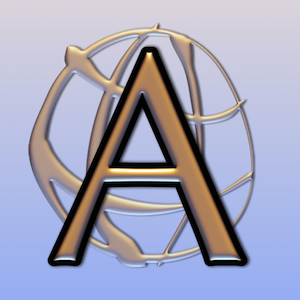 Whenever an "A" is detected, the amplitude of that A is shown on the bar corresponding to that frequency. The bar is white until it reaches an amplitude worthy of recording. You can set that level using the "Start Level" slider below. Setting it to 0.01 essentially records everything. You can hear each "A" by touching the corresponding label to the left of each bar. You can begin recording by touching the "Record" button. When "Only A" hears an "A" of sufficient amplitude, it will append that sound to its recording. The number of seconds so far recorded is reported in the button below the bar. You can resume recording the next time you touch the "Record" button. New audio will be appended to what is there already. You can clear the whole recording at any time by touching the "Clear" button. To stop recording, touch the "Off" or "Listen" buttons. A new screen then comes up so that you can enter information about that recording. Enter your name, age and location, and any comments you may wish to add. The name, age and locations are remembered. Audit your recording by touching the play arrow. Clear the recording by touching the "trash can (dust bin)"
Mail out the recording by touching the "mail out" button". Before the mail form appears, though, you'll see a progress window come up as it converts and compresses the sound to an M4A formatted file. This is so it will take up less space and more easily be mailed out. You can add other addresses to this list and otherwise edit the subject and message. The i button takes you to a page of instructions. and the content of the message is a list of the six floating point amplitudes of the Only A 'A's that it detects. You can use a large number of OSC compatible programs, like MAX, Supercollider, or Plogue Bidule to further process this information. Because each device running Only A can be uniquely identified, you can potentially make up a piece listening to A's transmitted from several devices. and it sounds like this: Your browser does not support the audio tag. Only A is by the author of the highly praised synthicity itself, Ellipsynth, SrutiBox, Droneo, Tondo, Wind Chimes, Enumero, Yes Session, Banshee, and LakePiano .